Clearly something dysfunctional was going on as related to the hospice where the defendant worked leading up to the Jan. 28, 2015 murder of 96-year-old McAllen resident Martin “Marty” Knell. When Patterson was charged with Knell’s murder seven months later, the Comfort House hospice was basically stone-cold broke. Had Patterson not been arrested when she was, August of 2015, the hospice presumably would have had to close its doors. There wasn’t enough money in its operating account to make payroll or pay the light bill. It had a bank account open under its name at Falcon International Bank through which financial transactions totaling more than $85,000 flowed while its board of directors remained deaf, dumb, and blind as to its very existence. The board also had no clue that its main bank operating account was in the red. The board tried to get its hands on the financials, but it seemed that every time the board met, according to former Board President Omar Guevara, Patterson had an excuse as to why she couldn’t provide them with bank statements, etc. Quick Books wasn’t working, she told the board during numerous board meetings, but she was doing her best to get the problem resolved. 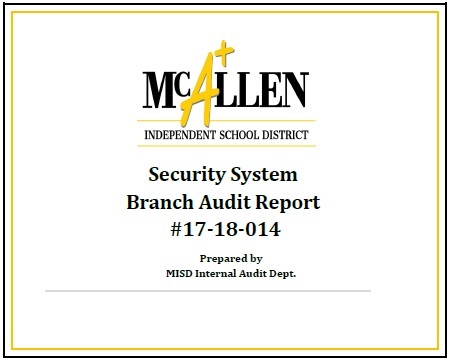 Sure, the 2014 fiscal year financial audit looked sound, but that’s because Patterson never included that Falcon Bank account in the financial documents she turned over to the CPA firm conducting the audit, Oscar R. Gonzalez, CPA & Associates, PLLC, according to court testimony given by one of the firm’s CPAs who heads up the auditing department, Melissa Gonzalez. In fact, said Gonzalez, Patterson had told the CPA firm that she was indeed handing them all of the information related to the hospice’s finances when the auditing process began in late 2014.
Who was in charge of turning over all of the financial information to the Gonzalez CPA firm, asked state prosecutors. “(Miss) Patterson,” said Gonzalez. Not only was the AWOL Falcon Bank account a problem, but one of the CPA firm’s employees, Laurie Suarez, who is first cousin to Melissa Gonzalez and married to former San Juan City Commissioner Heriberto “Eddie” Suarez (who has been handed a subpoena in this case), never informed her employer that she also worked part-time at the Comfort House. According to Melissa Gonzalez’s court testimony Wednesday, it was Laurie Suarez who first brought Comfort House to the attention of Oscar R. Gonzalez, CPA & Associates, PLLC, saying in December of 2014 that it was looking for a firm to conduct its 2014 fiscal year financial audit (ending June 30, 2014). According to Gonzalez, had the firm been made aware of Suarez’s ties to the Comfort House, it would not have been able to conduct the financial review because one standard of conducting a financial audit doesn’t allow for such a conflict. At the time, December of 2014, Suarez had been with the accounting firm for approximately two years, mainly working as one of its receptionists. In fact, it was Suarez who told Gonzalez that Patterson was interested in hiring the firm again to conduct the 2015 financial audit. “’(Miss) Patterson is counting on us,’ we were told,” said Gonzalez. That second audit went no further, Gonzalez said, after Patterson was arrested (August 2015). Prior to that arrest, however, the Gonzalez CPA Firm had already enacted an engagement letter with Comfort House to being the 2015 audit; and even though the general ledger was still missing, of the financial statements handed to the auditor, Melissa Gonzalez testified Wednesday that one thing stuck out like a sore thumb: the Comfort House’s investment account, which had approximately $106,000 in it the previous year, as identified in the 2014 financial audit, had basically been completely cleaned out. “It was pretty much all gone,” said Gonzalez. Gonzalez told jurors Wednesday that she had, at one point in time, recommended to the Comfort House board of directors that it needed to segregate the hospice’s financial operations. Separate the duties, she told them. When Assistant Criminal DA Joseph Orendain asked CPA Melissa Gonzalez if it was customary during an auditing process that she not be informed of all existing bank accounts related to the entity being audited, she said, “No.” (We) need all account balances tied to an entity to do a complete audit, she said. So, asked Orendain, that 2014 Comfort House audit was not a complete audit? Asked Orendain: If Melissa Gonzalez had known about the missing Falcon Bank account, would she have presented the 2014 audit to the Comfort House board of directors as being an accurate audit? Note: For this week’s complete trial wrap-up, check “anjournal.com” online tomorrow.